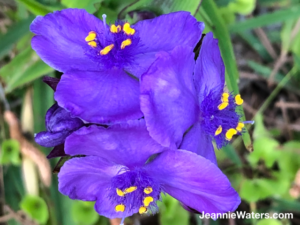 I learned an unexpected lesson while walking in my yard admiring the beauty of spring. Our snowball bush is a profuse bloomer this year. Its huge white, ball-shaped flowers demand attention. There are so many blooms, I can’t imagine one more fitting onto the branches. 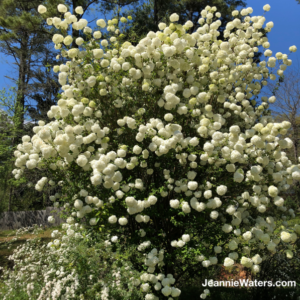 This glorious shrub reminds me of God’s blessings—bountiful and perfectly selected for us. His provisions shout out His love to us when we pay attention. I wonder how many times I miss them and how many times I notice but forget to express gratitude. Heavenly Father, lift my chin to notice the numerous ways You bless me. Thank You for the beauty of spring and eyes to see it. 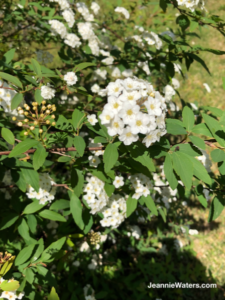 At the foot of the snowball, two spirea bushes grow. 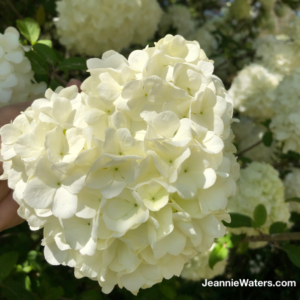 As a child, I named these plants “Bride’s Bouquet” because they bloom with small clumps of tiny white flowers. These decorative shrubs are graceful and add a delicate, lacy touch to the spring parade. God’s blessings also delight us, adding beauty and grace to our lives and preparing us to serve others. I wonder how many opportunities I miss to share these God-given gifts. Father God, remind me that blessings are not mine to tuck away and admire. Rather, they are designed to appreciate and share with those You place in my path. Make me a worthy steward of Your gifts. After admiring the large shrubs, I wandered around the yard and noticed weeds and wildflowers peeping through the grass. They, too, reminded me of God’s work in our lives. The onion grass and its characteristic smell pepper the lawn with light green stems and white flowers. “Weeds are a nuisance,” I thought. Upon closer examination, I observed pretty, delicate little flowers heralding a new season. Instead of characterizing onion grass as a pest, I appreciated it as a unique sign of spring and another of God’s creations. Do I look for the good in everything or am I too quick to complain? Dear God, remind me to thank You in all things. You give only good gifts. The next wildflowers I spotted impressed me with their royal color and dramatic shape. They stood in sharp contrast to the surrounding grass and urged me to take a closer look. Although their appearance was stunning, I’d almost missed them. I wonder if I ignore people in my path whose lives would enrich mine or vice versa. Heavenly Father, slow me down when I’m too busy to notice the people You send to teach me and the people You plan for me to serve. Use me to encourage someone today. As I studied other wildflowers through the lens of my camera, I realized they would disappear as soon as my husband cuts the grass. They would only provide colorful accessories to spring’s fashion show for only a few more days. How I wished they could stay. Some blessings are fleeting—ours to enjoy for only a brief time. A sunrise. A sunset. A new acquaintance. An opportunity to share the blessings of Christ Jesus. Lord Jesus, let me fix my gaze on You each morning so that I notice and embrace all of the gifts You prepare. May I not miss a single opportunity to share Your love with others. Is God’s creation reminding you of blessings? Please tell us about those you’ve received or shared recently. Next Post Next Post: Which Gifts Are on Your Table? God blessed me with a beautiful new friend! You! God, thank you for your many blessings, great and small. You are a blessing, my dear. I want to be more aware of God’s blessings, too. 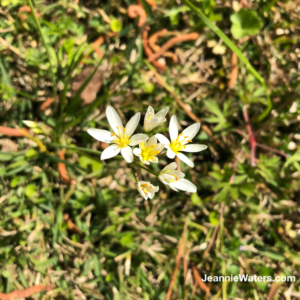 Jeannie, you blessed me by commenting on the tiny wildflowers in our yards! I thought I was one of the very few who lament when the grass (and beautiful tiny wildflowers) has to be cut. 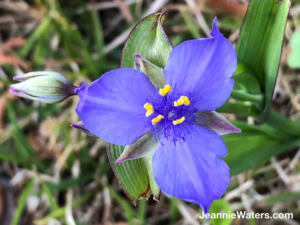 I was standing near our garage door and noticed yesterday that within just a few feet there were at least six different kinds of beautiful wildflowers–so tiny that you almost miss them, but intricately made and gorgeous in a delicate way. Even the flowers on “ugly weeds” can be beautiful! Thanks for letting me know I’m not alone. Yes, Glenda. That’s an important point. I am going right outside to see my beautiful flowers and Spring sprouts that God is giving to me to enjoy and inspire my thankfulness. First one, thank you for your blog !! Paula, we should do this daily at this time of year, don’t you think? Thank you. Jeannie, when I was growing up, Daddy took us on a walk in our woods. He pointed out the different wildflowers and flowering bushes and trees. We watched the squirrels scamper up trees and the rabbits hop out of our way when we stepped onto their path. Every year I returned with an armful of flowering treasures for Mother to place in vases and pretty pitchers. Those times are among my favorite childhood memories. 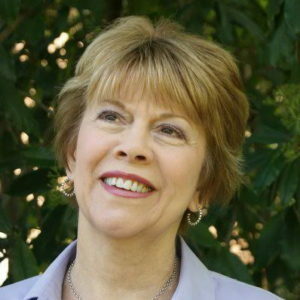 Thank you for your beautiful blog and for reminding me of good times and precious memories. Love and hugs! Evelyn, thank you for sharing sweet memories of time with your dad. My parents taught us the names of plants and flowers and instilled a love of nature, too, and I treasure that. God’s wonderful creation really shows off in the spring and reminds us of the bounty of His blessings.